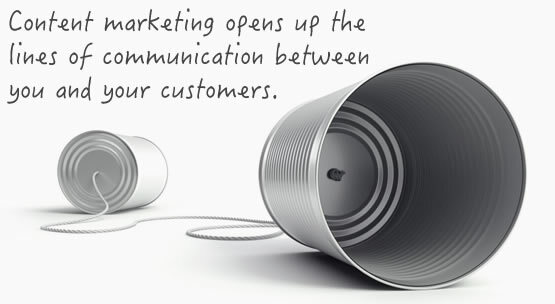 Inbound Marketing in Midland & Odessa, TX. Because Traditional Marketing is so... Old Fashioned. Content marketing, blogs, search engine optimization (SEO), call-to-actions (CTA), landing pages, social media marketing and email marketing are all part of the inbound marketing toolset. 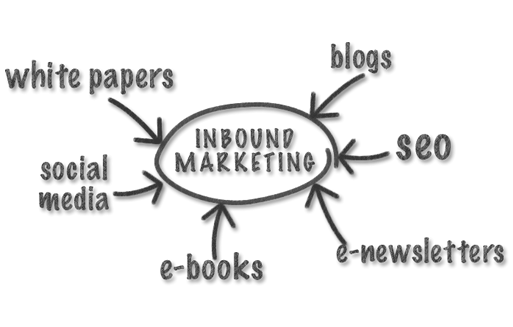 Read below as we explain inbound marketing in six easy steps. Define the purpose of your plan. What is the ROI of this Marketing Plan? How is this marketing program going to provide an ROI? How much should you invest in a marketing program? Who is your ideal customer and how can you attract them? Don't go cheap! A powerful, responsive website is the hub of all your online marketing and lead generation. By increasing the traffic to your website, you increase the number of opportunities for visitors to turn into leads. Blogging, Social Media and SEO are proven ways to bring new and qualified visitors to your site. A blog generates 55% more traffic! 400% more indexed pages are produced by blogging. 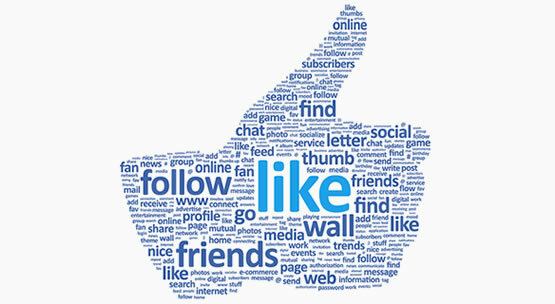 Businesses see 63% increase in marketing effectiveness when using social media. Nearly 2/3 of U.S. internet users regularly use a social network. 46% of daily searches are for info on products and services. Know which pages your leads view & when they return to your site. Lead scores are generated for all leads so you know who to contact first. 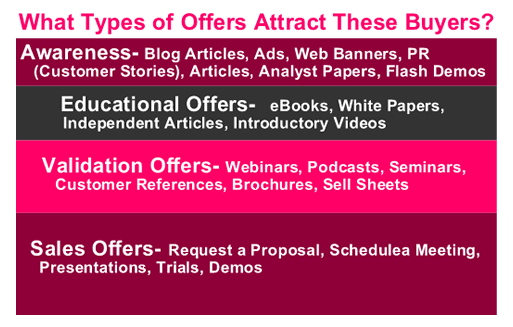 Various leads nurturing campaings are developed to further educate "Top of the Funnel" leads down to sales. Leads are segmented into lists based on the form they completed or information you collect. This allows you to quickly send targeted messages. Integrate a Customer Relation Management software for an improved sales process and a close-loop marketing campaign. Traffic to leads. Cost per lead. Leads to customers. Cost per customer. Blog referral sources. Blog Subscribers. Social engagement. Social audience size & growth. 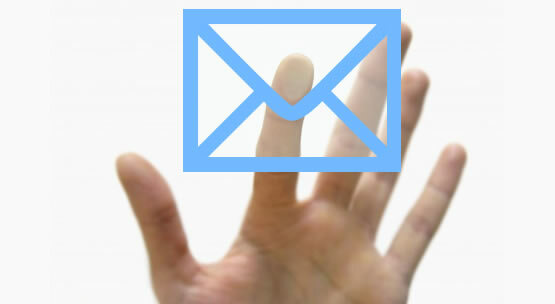 Email click-through rate. Email Subscribers. Website unique visitors. 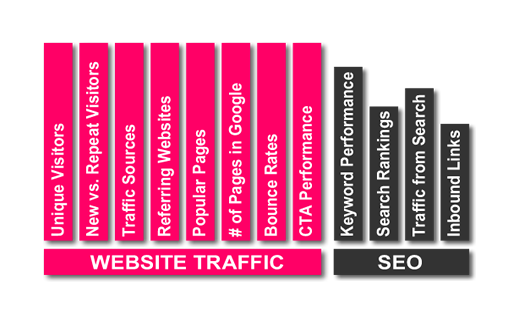 Website traffic sources. Search rankings. Traffic from search. Inbound marketing is a concept, methodology, and process to attract market qualified leads and convert them into long-term customers. Outbound marketing is expensive and being replaced with inbound marketing which typically costs 3X less per lead than outbound. 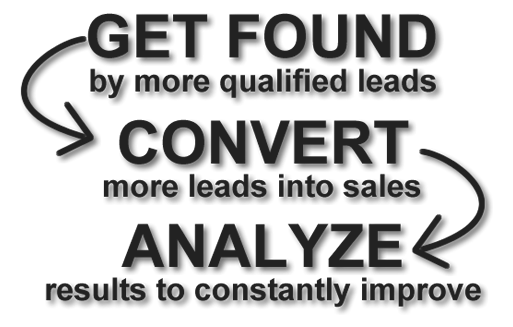 Content Marketing, Blogs, Search Engine Optimization (SEO), Call-To-Action (CTA), Landing Pages, Social Media Marketing, Email Marketing, Marketing Automation, Key Performance Indicator (KPI)… all are part of the inbound marketing toolset. 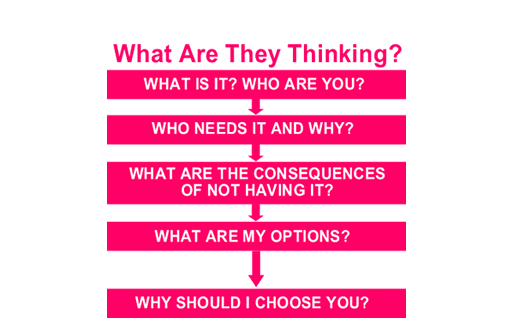 First we figure out the Who, What, and Why of your company to begin understanding and shaping your brand. 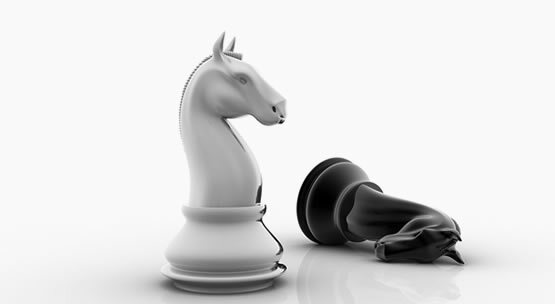 Once we've gotten to know you almost better than you know yourself, we'll develop an effective strategy to position your brand competitively. We'll help you communicate a consistent brand message across all channels which will allow internal and external customers to identify and remember you. Content Marketing, referred to as non-interruption marketing. Instead of pitching your products or services, it is the practice of educating your customer through your content. 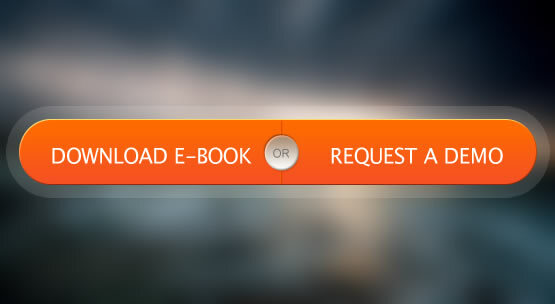 Creating an Ebook is a fantastic source of information for the public. If you deliver ongoing valuable information to customers, they ultimately will reward you with their business and loyalty. Let us create original, informative content for your company. We work with you to develop main points you want to educate the public on and write the content on your behalf. 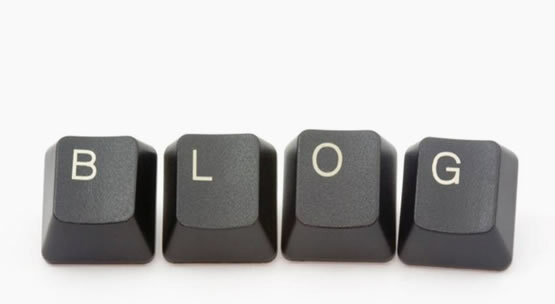 Nowadays, it's absolutely imperative that your business blogs. Keeping your blog up to date with interesting, thought provoking content is essential for your business. We work to develop a voice for your organization as well as writing, editing and proofreading content and make sure your blog doesn't skip a beat by creating original content. How does Google decide who ranks first? Well, it's Search Engine Optimization (SEO). SEO is one of the most widely used online marketing strategies used today. 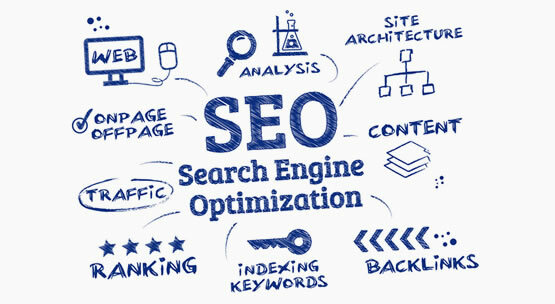 We use SEO to assist with your ranking throughout search engines and increase hits to your site. With a higher ranking and generally more hits to your site on daily basis, will cause their business to see a higher return on profits. We want your ranking to skyrocket with each piece of content you post and we're experts at coming up with relevant keywords, search terms and phrases. We'll work with you to assess your target audience or buyer personas to make sure you're getting the most out of our SEO efforts. We don't want you to fall into the habit of not posting on social channels. Your content is important, so why not share it with the world? We can make sure that the content you want to share gets posted during peak times for maximum viewership. We also provide content curation to make sure your account stays active on a daily basis. We can be involved a little or a lot: take a load off and let us curate, post and nurture your network on your behalf. Email marketing gives you a lot of insight about your progress and is a great tool for staying in touch with current clients, leads or prospects. The emails can be either something like a weekly newsletter, or a product release. With email marketing technology these days it's become even easier to track which of your marketing efforts are working such as tracking which links your recipients are clicking on. We can work with you to create clever, marketing emails your recipients will want to open and figure out who you should be targeting with your efforts. Your business has a lot to offer so why not start with an effective Call-to-Action? A CTA is a prompt for anything from an event, or workshop to Ebooks and other informative documents. Let us know your goals and what you can offer to your future clients. 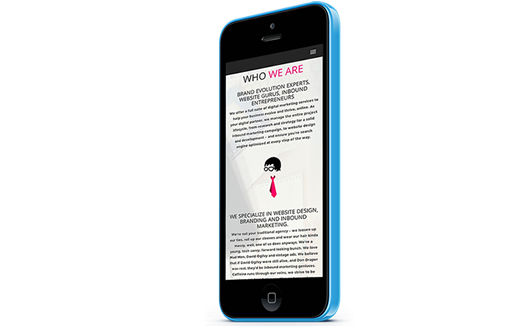 We can create not only an eye-catching CTA but all the stuff that comes with it. 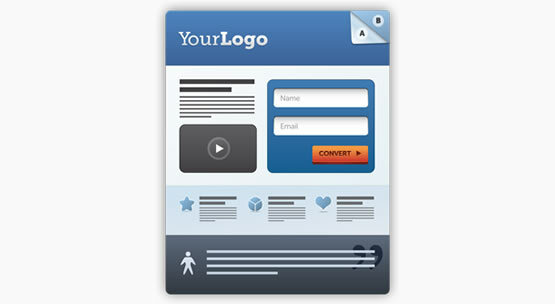 Landing Pages are what stand between you and a lead. With seconds to impress a potential client Landing Pages need to have short but interesting copy, images and an offer the client would be crazy to pass up. Remember that old infomercial catch phrase: "Set It And Forget It"? Marketing Automation is exactly that. It's a massive time-saver for businesses and can generate more leads. For example: When someone downloads material from your website, marketing automation can arrange to send a follow up email asking if they have any questions, or perhaps an additional download about something similar. 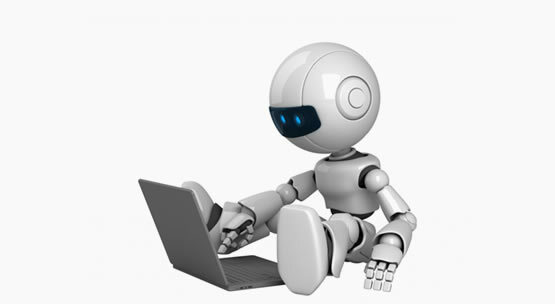 Marketing automation is great for small or large businesses and is a great way to nurture clients.